I have had so many suggestions for tutorials, I want to thank all those who have contacted me inworld, formally on here. Thanks for your positive comments, and your interest in keeping this project of mine going. For today's Tutorial Thursday I am going to be showing you Picmonkey, a fun browser site, that allows you to do some quick editing, without having to download anything onto your computer. There is no requirement to sign up to the site to use it, though there are premium abilities with a paid account. All these special features are clearly marked when browsing the different menus on the site. I am mainly a Photoshop user, but when I blog on my other avatars, I like to be able to do it quickly, in most cases, as blogging on 3 separate avatars, on 3 separate sites, can get a little crazy at times. 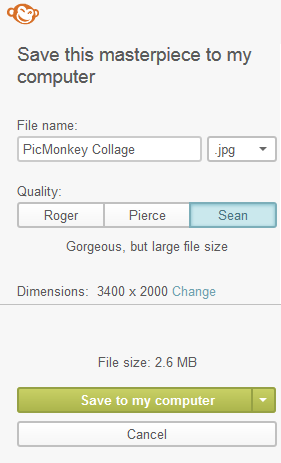 I use Picmonkey for my two other avatars. I will be doing a continuing series on Picmonkey, but today I thought I'd show you a quick way to get a decent photo processed using the site. This could be good if you are a blogger starting out and have no post processing software, or just want to update your inworld profile picture. The lovely LadyLight Koolhoven was my model for this shot today, which I will be editing with during the course of this tutorial. This shot is a raw taken inworld, in the windlight of her choice. This tutorial will continue after the break, for the sake of the feeds that Free*style is published on. If you are still interested, please click on through. Please click on the photos when needed to enlarge the shots. This will help you better understand what is going on during each part of the tutorial. When you go to Picmonkey, at the top you will see these icons. For the sake of this tutorial, we will be selecting the Edit icon. Then you will get a popup, and you just pick whichever photo you want to edit. You will arrive at this screen, which is your editing window. To the left are a series of icons, these allow you to switch between the different editing menus. At the top is another little bar, which is fairly self explanatory, the back and forward buttons allow you to erase a mistake, or see if you like a certain edit by clicking between the 2. The Icons at the left are as follows(from top to bottom). Basic Edits, Effects, Touch Up, Text, Overlays, Frames, Textures and Themes. Today we will only be using Basic Edits and Effects. Like I said, this will be a quick photo processing. It normally only takes me 5 minutes, with text included. First thing I do is crop my shot. You need to be in Basic Edit for this. To the left you have the option of manually sizing your photo, or you can pick from a series of preset ratios, in the drop-down. I normally play with the resizer which is right on the photo, as it is easier to get the scene I want that way. When you get it how you want it, hit the green Apply button. If you are not totally happy, just click the back arrow on the top bar, then try again. So now I have it the size I want it, I want to make it look a little more "Special". I do this in the Effects menu. So click the Effects Icon on the left sidebar. Now, there are a lot of Effects, and you could play all day with them I am sure. I am just going to do a few for this photo, so you can get the feel of how to layer them. Here I used the very first Effect option, which is Orton. I left Bloom and Brightness alone, and changed the Fade to 50%. Then clicked Apply. I then click on Cross Process. I normally don't use this for blogging, as this will change the overall colour of things, and I like to try to show items as close to their actual inworld representation as possible. Because this is just a tutorial, I am going to use this, as it makes for a more vibrant finished photo. I kept the Effect on Green, and changed the Fade to 50%. Then clicked Apply. The change is subtle, but I like the slight change in the colours. I then go way way down to the bottom of the list. Click the Effect called Focal Soften, you will see a circle on your photo, and it'll look blurry around the edges. Go into the centre of the circle, click your mouse, then position the circle where you want the photo's focus to be. I like a bigger focal point, so I enlarge the Focal Size to 80%. Then clicked Apply. I then go to the middle of the Effects, to one called Dark Edges. It is my person taste to have a bit of a border, that isn't just a set frame(you can put frames on in the Frame icon). For this shot, I changed the Intensity to 20%. Then clicked Apply. At this point you could be done. If I was blogging I would watermark the avatar's name somewhere, either prominently, or subtly. Then you would save your finished photo by clicking save at the top bar. You will come to a menu, with various saving options. Pick what you want, save, then you are done! Just so you can see where we started, and where we ended up, here is the side by side comparison. I hope you enjoy Picmonkey!